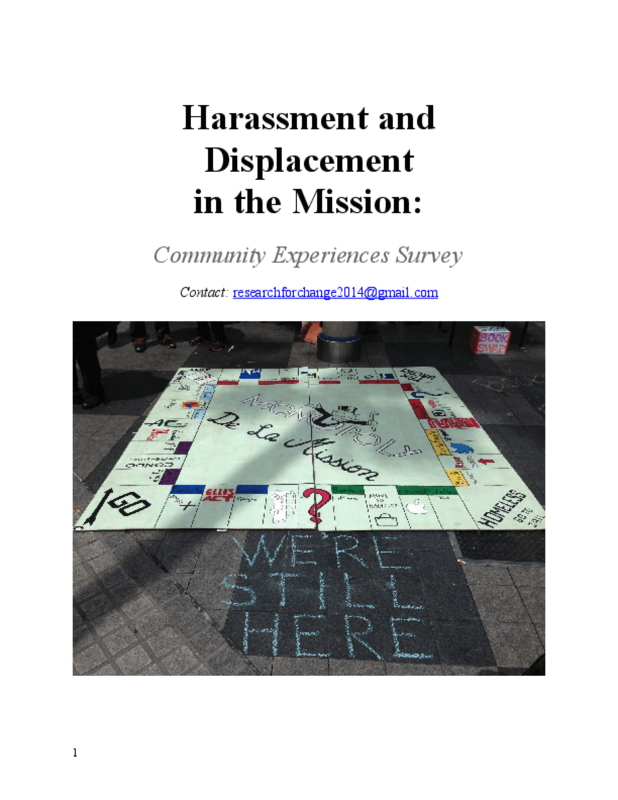 In partnership with Mission district service providers, the Coalition on Homelessness conducted a survey about experiences of harassment and criminalization in the Mission. We initiated this project after hearing reports from poor and homeless Mission residents that they were experiencing heightened harassment and displacement from their neighborhood. We wanted to know whether these were isolated incidents, or whether these problems were widespread. We also wanted to know what would make Mission residents feel safer in their neighborhood. Surveys were administered by volunteers and service providers at the Coalition on Homelessness, Community United Against Violence, El/La Para Trans Latinas, Mission Neighborhood Resource Center, Mission SRO Collaborative, and Saint James Infirmary. Surveys were collected at service organizations in the Mission, as well as outdoors near the 16th Street Mission BART Plaza between December 2013 and March 2014. Copyright 2014 by Coalition on Homelessness. All rights reserved.